Answer, Inc. dba Contact One Call Center of Denver, CO has been honored with the exclusive 2010 Award of Excellence. 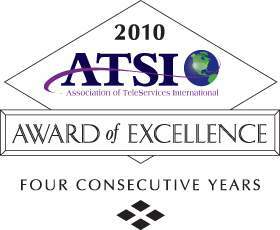 The award is presented annually by the Association of TeleServices International (ATSI), the industry’s trade association for providers of telecommunications and call centre services including telephone answering and message delivery. Answer, Inc. dba Contact One Call Center was presented with the award at ATSI’s 2010 Annual Convention. After six months of intensive testing, an independent panel of judges scored call-handling skills such as courtesy, response time, accuracy, and overall service to their clients, the cornerstones of the call management industry. If a company scored 80% or better in all categories, they are presented with the coveted Award of Excellence. "The Award of Excellence is a 'mystery shopper' program that provides independent testing for quality assurance in customer service levels." says ATSI President Allan Fromm. "We congragulate Answer, Inc. dba Contact One Call Center for their achievements." Now a four time winner, Answer, Inc. dba Contact One Call Center earned the Silver Award for four consecutive years. Contact One has won the award every year it has participated. ATSI extends its congratulations to the staff of Answer, Inc. dba Contact One Call Center on their proven quality service to their customers. The Association of TeleServices International was founded in 1942 as a national trade association representing live answering services. ATSI now encompasses companies across the United States offering specialized and enhanced operator based services including: call centers, contact centers, inbound telemarketing (order entry), paging, voice messaging, emergency dispatch, fax, and internet services among others.